I had an idea for an eredar Demon Lord hero with heavy influence from Mannoroth; a ranged sustained-damage assassin who specializes in punishing AOE healers. D trait; Tainted Blood. 100% of AA damage is dealt as damage-over-time. 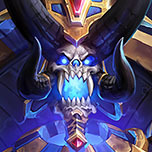 Attacking a hero with DoT stacks of any kind gives the Demon Lord an attack speed boost for the next attack up to 100% for heroes who will die unless healed. Enemies afflicted with Tainted Blood gives the Demon Lord mana regen and he can cast spells on them at any range. W ability; Immolate. A fast-casting but high-mana ability that inflicts an enemy hero with AOE damage to self and nearby enemies for 3 seconds. The Demon Lord passively has an Immolate that only damages hostile enemies (doesn't trigger passive neutrals) when he has mana, and does up to 100% bonus damage the more mana he has. Q ability; Doomguard. Summons a single, permanent (cooldown triggers upon his death) minion bodyguard. Has high spell armor, and gets a movespeed, heal-on-attack and cleaving attack when in the radius of Immolate. Talent: Orb of (Any given Element ex. Fire, Darkness, Venom, Lightning and etc.) - Just like back in Warcraft 3, much of the Dreadlords has a given Orb depending on their character themselves, thus increasing their Basic Attack Damage, it Splashes and allows them to hit Flying and evasive Units easier. Presence of The Nathrezim: Nearby Allied Units, Summoned Units and Heroes gains Health when they hit a enemy unit, and grants himself only a 22.5% Increased Bonus Damage while Allies gains half of the Bonus Damage with 11.25% only, some of his Basic and Heroics Abilities benefits from the effects of this trait. 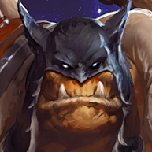 Vampiric Bloodfang: Sends a horde of bloodsucking fel bat like creatures in a cone area on front of him, dealing 150 damage per unit, This Ability benefits from the Hero's Trait, Reactivate to transform one into a unique Fel Bat like creature to teleport. Comatose: The targeted enemy unit puts under a death like sleep state for a short duration, powerful against Enemy heroes that stops them from moving, escaping, attacking, most passives stops, stops casting spells, abilities and etc. A unit under a coma can only be awoken by healing it, last for 6 Seconds, and Does not benefit from the Lifesteal effect. Plague Swarm: He releases a swarm of plague enegies on a targeted area to damage enemies dealing 50 damage per sec. that last for 4 Seconds, The Ability benefits from the Hero's Trait, abling it to Siphon Health as well. 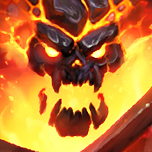 Inferno: Calls a much more Powerful Infernal (Than of Guldan's Infernal, if he was able to and if given the chance) down from the sky, dealing 80 Damage and stunning enemy land units for 4 seconds in an area. The Infernal is affected by the Hero's Trait and Lasts 18 Seconds. Finger of Thal'Kituun: Fires a powerful a electric and void like stream of energy to a targeted hero, dealing 50 damage per second, Reactivate to "control" the enemy hero itself, allowing him to use the hero's unique abilities, while dealing damage and siphons health due to being affected by the Hero Trait, but the foe cannot die from it, Last for 8 seconds. For some of your characters Cva, they won't or wouldnt be added before another character/ already replaced. replaced: Rok'han for Vol'jin, Grom for Garrosh, Shandris/Naisha for Tyrande, Antonidas for Jaina, Vashj for Azshara, Cenarius for Malfurion, Daelin for Greymane, and Akama for Yrel. Some of these could be added, but they already have a similar or placement of some sort. Vanndar and Drek'that wont be added(at elast for a while) because of their skins. Nazgrel and Danath wont be added due to their unknown abilities and irrelevance. I think Lady Vashj would be an good pic for a new Hero. Some ARE feasible, just not as likely as others. Compare Vashj and Azshara. people love Vashj, but Azshara is just simply more popular and powerful. A pair that could both be chosen equally are Varok and Broxigar. One known for hurting Sargeras and the other just liked as honorable and kind. Im not complaining of choice or some, just worried. Worried about there being carbon copies or too similar to each other. Most of the only way to know if a character can be added is if they have potential switching to another style unalike another. Xu'tenash of Ruin: Mannoroth strikes with such force that he damages multiple enemies with his attacks, with a 25% Damage Splash, and wounds enemy units for 10 damage per second that last for 2 seconds. Hellstorm: Mannoroth calls down a Hellstorm! As waves of fire damages enemy units in the target area, burning for 8 additional damage per sec. for 5 Seconds. Inflicting 40 Damage each and rains over for 4x. Destroyer's Gaze: Mannoroth horrifies nearby enemy units, inflicting 50 Damage and ruduces Attack and Defense both by 25% last for 2 seconds. Flay Barrage: He thrust and blast a targeted unit, inflicting 100 damage, knocks them back, while also gains additional 20 damage if wounded by his Hero Trait. Doom: Marks a target hero for the manifestation of a Demon. The afflicted unit will take 60 damage per second until it dies. Upon its death, a great Demon will spawn from its corpse. Doom Guard cannot be dispelled or canceled. Felseeker: Mannoroth unleashes consecutive blasts in quick succession. The first inflicts 50 in a small radius of the area, then 80 in a medium radius, and finally 100 Fire damage within a large radius. Nice build, but move the glaive or an ability of glaive-based to the barrage and replace the Doom with Destructor's Hatred, giving him increased damage and speed to who he sees in his vision of just in general. Thank you so much, sure!! I'll try!!! You could add his blood or Hatred as some trait or ability, but the blood's optional somewhat. Sorry for the very looong delay, i got busy in school... hopefully in the past coming days, i'll be able to post and update again of some Hero Concepts!! Thanks!!! Vanguard of the Legion: Only his Primary Abilities has a 5% percent chance of summoning Demonic Minions to his side, additionally, him (including Primary Abilities) and his minions will have a 5% Bash on his enemies lasting 0.5 Second and also a 10% Spell Resistance on himself only. Collapsing Gateways: Archimonde creates two small unstable Dark Portals in both hands, and flings them forward, dealing 70 damage, if it hits a Hero, it has a increased 20% chance only of spawning Fel Demons. Chaos Wrath: Archimonde brands all enemies around him, after a 0.75 Sec delay, it explodes for 50 Damage, 85 on Heroes, if the Hero dies while still affected, it spawns an Infernal up to two only, regardless of how many heroes are killed. Soul Charge: Archimonde can choose to sacrifice his minions, Basic Ground Troops (except Catapaults and Mercenaries) Regens Health and Mana, Consuming Fel Demons debuffs enemies of anykind, Minor Infernals will deal 70 with a plus 10 damage per sec. to the Enemy's Health and Mana that last for 5 seconds. Doomfire: Archimonde sets the area around him on a powerful Fel Fire, dealing 50 Damage per second that last for 5 Seconds, if enemy Heroes got caught in it, the attack itself will form a uncontrollable Doomfire Spirit that will quickly chase down escaping heroes while also dealing the same damage. Hand of Death: If the targeted Hero is on a 18% or lower Health, Archimonde brands the unit, after a 1 second delay, he blast the enemy, instantly killing the unit on the process, will not work if the Enemy Hero is Stealth or Invulnerable.